Polished concrete improves the appearance, enhancing concrete floors. Concrete polishing has become the most unique flooring option on the market since every concrete floor has unique characteristics. Decorative cutting and dyes can create visually interesting floors. Concrete polishing is a multi-step process, depending on the quality of surface. The process uses diamonds to “sand” the concrete smooth, similar to the sanding of wood. 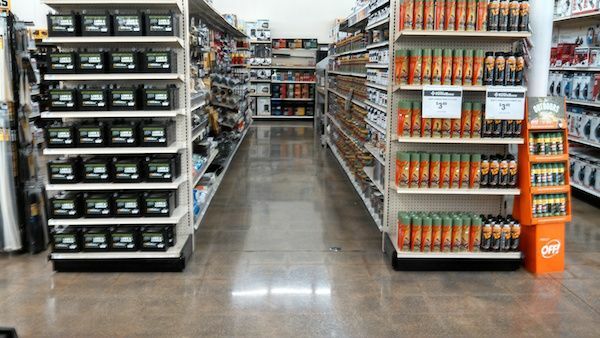 Each step utilizes a different grit increment to create a more reflective, smoother floor. With the use of industrial vacuums, polishing is a dry, fume-free process. Michigan Concrete utilizes Prosoco/Consolideck products, as they are the best options in concrete dyes, sealers, and cleaners. The videos below demonstrate some of the steps required for a dye and polish. "Dear Tom, I just wanted to take a moment to tell you what a wonderful job was done polishing and staining our basement floor. We are so pleased with the results. Despite the unforeseen difficulties of the project, it became apparent how awesome of a team you are." Simply put, a polished concrete floor system transforms a porous concrete floor into a tightened surface, dense enough to keep water, oil, and other contaminants from penetrating the surface. There are dozens of ways for concrete floors to break as they get old: rain damage, surface stress, delamination, improper curing, curled cold joints, joint shoulder failure...the list goes on. 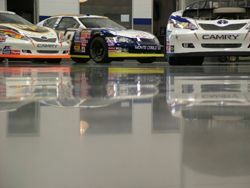 But one solution, the Polished Concrete floor system, can make any floor look better than new. We actually remove the top part of the surface of your old concrete floor (including any patchy, partial, or whole coatings), and harden what was once beneath the old surface. Old, deteriorating, or weak concrete can be strengthened, and have its impact resistance and abrasion resistance increased, once the floor has been polished. With a floor as reflective as a polished concrete floor, the increased lighting in your facility doesn't just make it easier on your lighting bill or merely make your floor look more beautiful. Whether employee or customer, anyone in your facility who is able to see better will be able to use your facility more easily than before. Can any other floor system do that? When a concrete floor is polished, it may look like glass, but it has a higher friction co-efficient than ordinary concrete. Simply put, it is much harder to slip on a polished concrete floor, wet or dry. Polished Concrete always meets and often exceeds OSHA standards for floors. In other floor systems, a tire mark is usually there to stay until the floor is repaired. With a polished concrete floor system, ordinary cleaning removes such blemishes immediately. In heavy industrial facilities, rough and uneven surfaces cause tires to wear out rather quickly. Most concrete floors have small "curling" joints, from where the concrete bows upward on the edges during concrete curing. Getting a Polished Concrete floor system on these areas will level the joints and make the entire surface smooth, making tires last much longer. 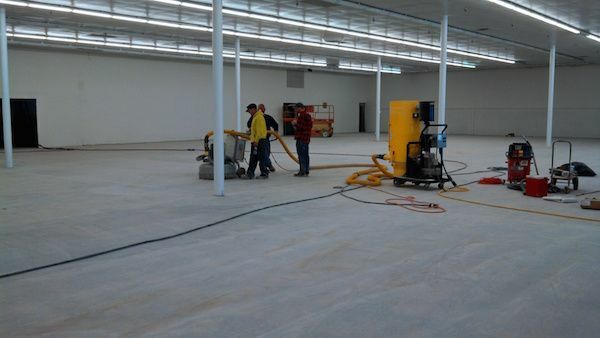 Most floor systems, even ordinary concrete floors, require aggressive scrubbing. Oil, paint, and other staining spills can leave lasting impressions on ordinary surfaces. 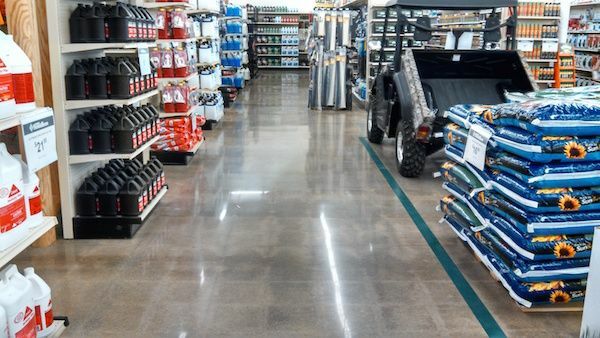 But a polished concrete floor system doesn't require such intense scrubbing -- the surface is so tightly compacted that it actually repels oils and other substances, making cleaning much easier than with other floors. Polished areas can be put into service immediately after the process is complete. Due to the cleanliness of the process and the lack of toxic or hazardous chemicals, we have helped food manufacturing corporations, pharmaceutical manufacturers and other medical supply corporations meet the strict condition standards that their floors require. In many cases you can install a polished concrete floor system while the plant is in full production. Polished Concrete floors have been installed in hospitals, with patients, family and hospital staff walking on the floors, without interruption to their daily routine & activity. The savings from a polished concrete floor system easily runs into the hundreds of thousands of dollars for most facilities, even in a 10-12 year period. The numbers speak for themselves. With Polished Concrete, there is no need to wax or strip the floor. All the maintenance hours and cost that used to have to be spent on such things can finally be spent elsewhere, since a Polished Concrete floor system never needs it! Polished concrete can sometimes be mistaken for marble; it is so smooth and attractive. No other floor system can boast such beauty as a Polished CoPolished concrete can sometimes be mistaken for marble; it is so smooth and attractive. No other floor system can boast such beauty as a Polished Concrete floor system. Epoxies don't even come close. Photos may help tell the story, but a real-life demo will make you a believer. ncrete floor system. Epoxies don't even come close. Photos may help tell the story, but a real-life demo will make you a believer. There is simply no comparison to other floor systems when it comes to how long a floor can last. 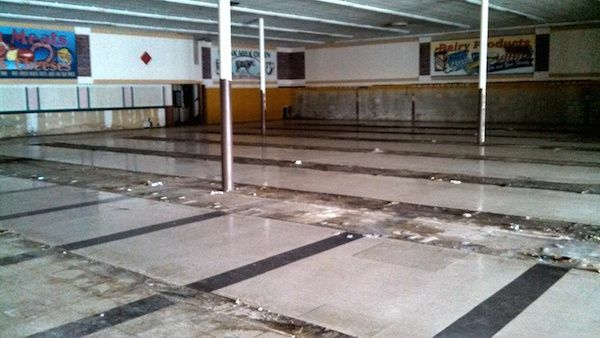 The first Polished Concrete floor systems are still in excellent condition, and in the event that they need to be refurbished, that can be done at a fraction of the cost of any other floor system, extending the life that much farther.